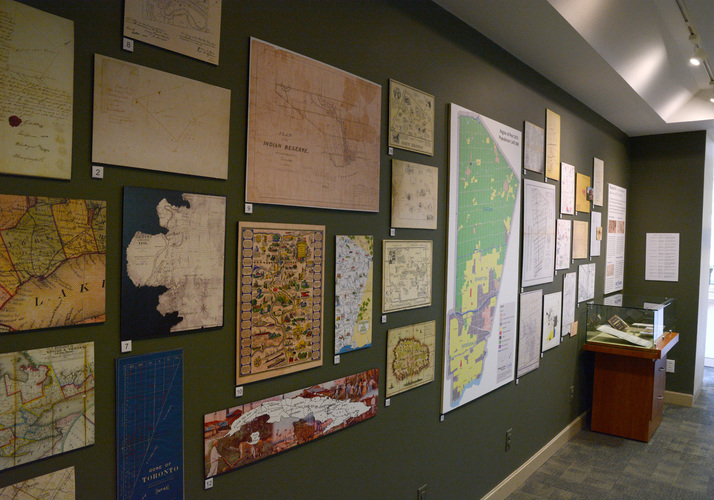 The Peel Archives is pleased to announce the opening of a new exhibition: Mapping Peel: An exploration of maps from the Peel Archives, 1805-2013. Visitors to the Reading Room will be able to feast their eyes on a wide range of maps and plans documenting the Peel area, including land treaty boundaries, county borders in the Province of Canada, village and subdivision plans, “animated” folklore maps, road maps, public transit routes, and much more! Also on display are two beautiful maps of the islands of Cuba and St. Helena. Why does Peel have these in the collection? Come in and find out! The majority of the maps are reproductions of originals and have been mounted on the exhibition wall in the Reading Room. In some cases this has allowed us to enlarge details that might otherwise have gone unnoticed. But map enthusiasts do not need to despair — we are also showcasing some original maps in a display case. Rulers throughout history have sought to bolster claims of land ownership by referencing drawn borders on a map. This continues today, with the leaders of the USA, Russia, and Canada all using different maps to claim ownership of arctic areas. Hopefully visitors to the exhibition will come away with a new appreciation of both the beauty and potential power of maps. The archivists here have put a great deal of thought into the selection of maps and plans currently on display, and we hope that the public will find them as enthralling as we do! Finally, I would like to personally thank staff here for their help with selecting, digitizing, printing, and mounting the maps and plans included in this exhibition. So, my heartfelt thanks go out to PAMA’s Nick Moreau (Reprographics Specialist), Samantha Thompson (Archivist), Kristen Young (Archives Assistant), Chrissy Howard (Museum Curatorial Assistant), Maureen Couse (Exhibition Coordinator), and Jim Leonard (Regional Archivist). ← How do archivists organize collections?